You might remember when I posted this recipe three years ago. Now that it is strawberry season again and I am a tiny bit strawberry focused (or sure, we can call it obsessed if you prefer) – I decided to re-post this for you now. 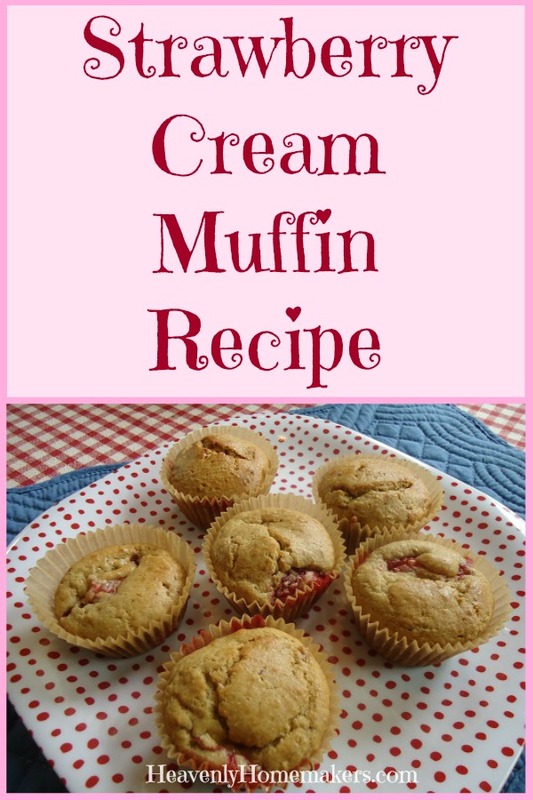 This Strawberry Cream Muffin is so delicious, you’ll feel like you’re eating dessert for breakfast or snack. Take note that the sour cream in these muffins makes all the difference in how moist and delicious these are. Can you use milk or coconut milk (to make them dairy free) instead? Yes. But they will likely turn out just a little bit dry. Just eat them fresh out of the oven and you’re golden. Stir together flour, sucanat, baking powder, and salt. Add oil, egg, and sour cream, mixing well. Scoop batter into 12 well greased or paper-lined muffin cups. Bake in a 375° oven for 18-20 minutes or until lightly browned. Now my best tip of all: Mix up the batter and freeze it to make your muffin baking/dish washing life easier! Then all you have to do is grab your frozen muffin batter cups out of the freezer, put them into muffin cups the night before you want to bake the muffins, then stumble into the kitchen in the morning and put them into the oven! I’m loving these Silicone Muffin Cups, by the way. 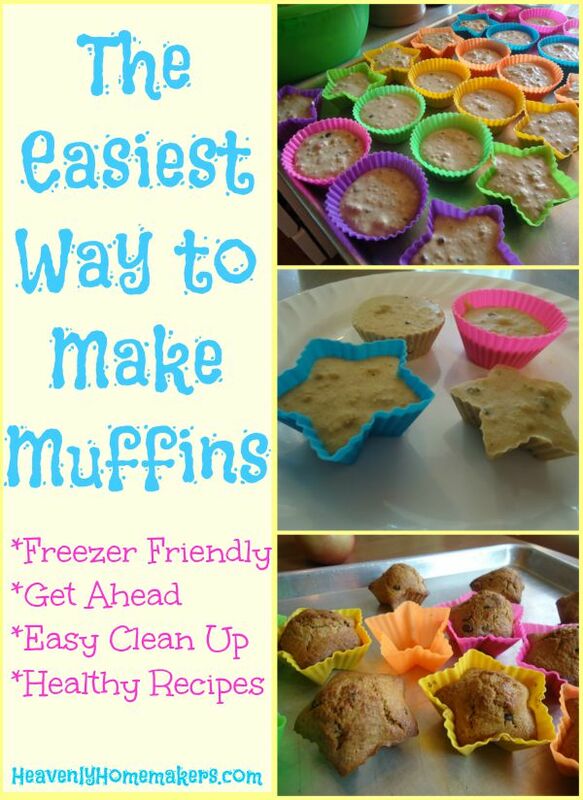 I’ve been using them for a few months now and they make freezing muffin batter so easy! Plus I love that I’m saving money on paper liners. Read more details about this simple time and money saving process here. Have you tried freezing muffin batter? How about silicone cups? Can’t wait to hear how you like the Strawberry Cream Muffins! P.S. We have not one but two weddings we are heavily involved in this weekend! Starting yesterday, we have been/are running from party to shower to rehearsal to set up to other rehearsal to wedding to getting hair fixed to wedding. If you didn’t follow all of that, don’t worry. I have it all scheduled down the the minute on my calendar. All that to say, you have no idea how happy I was when I found some frozen muffin batter cups in my freezer on Wednesday. I tossed them at my kids to make for their breakfast Saturday. Perfect! Going to try these right now! Hubby got called in to work late tonight and I’m trying to stay up and wait for him. These look awesome! I have 2 lbs of fresh picked raspberries I just put away in my freezer….I’m gonna substitute the strawberries in this recipe with the raspberries and I think it will be yummy too! Thank you for this recipe! I will be baking these for breakfast this weekend! I forgot to ask my question in my previous post….sorry! If I substitute honey for sugar or sucanat, do I need to cut down on the sour cream or melted butter? Thanks!! In the instructions it says, “add oil, egg, and milk.” I assume that should be sour cream instead of milk? These were tasty this morning. Thanks for the recipe! I like the idea of using sour cream instead of milk. I actually used plain yogurt because we had it on hand. Very moist! We will be making again. Thanks! We are just about to make these. I love your recipes. They are so simple and I nearly always have everything on hand! Your comment, “you’ll feel like you’re eating dessert,” made me chuckle. We have an on-going conversation at our house about why we can make essentially the same thing, and if we call it a cupcake it’s a dessert, but if we call it a muffin it’s okay for breakfast. Same thing with cake/coffee cake. So what’s the difference? With some recipes I would say there is less sugar for the “breakfast” items, but that’s definitely not always true. The Muffin Mom, the Muffin Mom? Oh, do you know the Muffin Mom? You can defrost them just enough to chop them. Is it ok to freeze the batter when using sour cream? If I use unbleached white flour for this recipe, do I have to adjust the recipe any? I think you’ll be able to follow the recipe as is. Maybe start with a little less sour cream because whole wheat flour tends to need more liquid than white. I made these in the last couple of hours. Mine rose beautifully, but after cooling, they fell in the middle. I only baked 18 min (and my tester came out clean) but I think I’ll try 19 min next time. I used an egg substitute, so I’m not worried about my family getting sick from “underbaked” muffins. They were VERY moist, to the point that my husband agreed they were a bit underdone. However, I also used frozen strawberries – I defrosted them in the microwave for about 15 seconds, then chopped them up. Some of the extra “moist” in the muffin was probably from the strawberries finishing defrosting while baking. I also used homemade yogurt (not strained, so more the consistency of non-Greek) instead of sour cream. We all enjoyed the flavor, so I’ll just bake an extra minute next time, and hopefully all will be well. I also only did one batch, just in case we didn’t care for them. When I made the chocolate chocolate chip muffins, we thought they needed a little more sugar (I probably reduced it from the recipe, as I usually do, just a little), so I was glad I didn’t make double or triple of the recipe. Question; Could you use almond flour as the sub. for whole wheat? I have been looking for a strawberry muffin recipe. Made these last night, and I don’t think they turned out right. ughhhh.. I only had white flour, and used regular white sugar, and used margarine,(didn’t have butter, and have never tried coconut oil) wonder if this was the reason these didn’t turn out right….. UGHHH. Yumm! I made these last night. 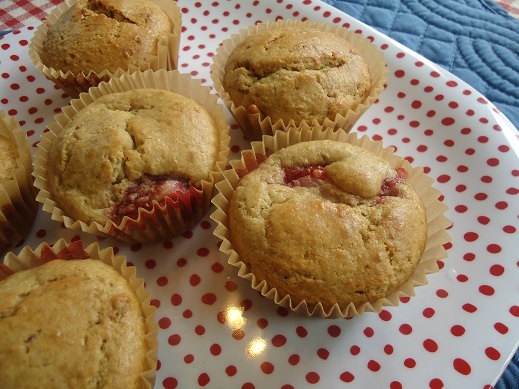 I have a different strawberry muffin recipe that uses oats that you blend to make oat flour. I like the added nutrition with the oats so I used my homemade oat flour instead of the wheat flour. I also used honey and coconut oil and fresh strawberries. I kept all the measurements the same and they came out so moist and tasted Awesome. Thank you! This will be a staple for us so i will have to try your freezing method. Just made these muffins with my daughter and they were delicious! I thought about substituting whole milk yogurt for the sour cream, but wondered if the muffins would have the same creaminess. I used white whole wheat flour and was pleasantly surprised to see how light in color they came out. They will be a perfect nut free snack to bring to preschool this fall. I find preschoolers who usually eat refined white flour to be a little skeptical of whole wheat. Kristin, thanks for the idea of preschool snacks – in fact, they would be a good idea for kindergarten snacks too. I shared this recipe with a friend, but when I came on here to find it, your search engine didn’t find it (at least it wasn’t in the top page worth of finds). I had to go through your home page and keep scrolling down until I found it. I made these for breakfast on Father’s Day & served them topped with whipped cream & blueberries. We drank milk with them. Yummmmmy! I think I found another “family favorite” recipe. I want to make this with other berries too. I was wondering you could share your link to all the muffin recipes you have? I know I saw it somewhere but I can’t seem to find it:/ I wanted to try to freeze some muffin batter to keep in my freezer since I work at a school(not as a teacher) and my 2 kids and I are starting on the 8th of September! This would save a lot of time! Also need to look at what else they like that I can make ahead and freeze! They are very picky kiddos and can’t make them try anything new:/ thanks!! How do you clean your silicone muffin liners? I tried hand washing. I have a difficult time getting the food out of the cracks. If I put them in the dishwasher they get a strange white powdery residue on them that does not wash off. I’ve even put them in the washing machine and they still do not get clean. Thanks for your tips. Hey Laura, do you have any tips for cleaning the silicone muffin cups. I got some for Christmas, but if I make a “juicy” muffin, like blueberry, they seem to stick in the fluting of the cups and it’s really hard to get out. I hand wash them, but then when they dry I see all the crumbs that I missed. Just thought since you use them so much, you’d have some handy tip for me. I use silicone muffin pans that are just like regular muffin tins (6 to a “pan,” not fluted) – so you don’t get all the fun shapes but they are super easy to clean! I have held out using the silicone cups, because I’ve been concerned about leaching of chemicals into the muffin. (what kind of chemical? Well, I have no idea) — I was just holding out until I researched it. Just wondering if you’ve looked into this, or no? I have looked into it quite a bit and silicone seems to be safe to use! Thank you so much for sharing your recipes. I know this one was posted years ago, but tried it today with blackberries (instead of strawberries), because that’s what we have on hand. I love this muffin recipe and the freezer technique too!